Tonight marks the end of another season of The Walking Dead, a date that always seems to come just a little too soon for fans. And that goes even more so for this season, a season which, heading into the finale, is the best since Season 1 – perhaps even just a little bit better. But in order for Season 5 to be the triumph it’s been setting up to be, it’s final act needs to deliver; after all, there won’t be any more TWD until October, so the events tonight will, by their nature, set the tone for the kind of anticipation fans will feel in the long interim months. And tonight, they did just that – they delivered. Click through for my full review and episode synopsis – it’s a big one, almost 6000 words; the tl/dr is at the bottom, along with a poll regarding who you’re most likely to see as a role-model in the zombie apocalypse. Enjoy! Last week’s episode left us with a lot of hanging plots, not the least of which involve how Deanna is going to take her son, Aiden’s, death, and how Rick intends to deal with the wife and child abuser Pete, who just so happens to also be the community’s doctor. Things are just a little too “normal” in Alexandria, and there’s a sense that the wheels are about to come off for several members of our group. Click through for my review and synopsis. Two episodes to go, and a couple of real cliff-hangers left over from last week’s episode, means that we should be in for a tense and action-filled show this Sunday. In one of the clips below, there are several freshly dug graves – who’s in them? Click through for preview videos, and my ideas on what’s going to happen this week. After last week’s focus on Mike Ehrmantraut [Jonathon Banks] and his reasons for coming to Albuquerque, this week we spend more time with Jimmy [Bob Odenkirk]. Things with the Kettlemans are coming to a head, and Betsy [Julie Ann Emery] isn’t happy when people try to accuse her dear Craig [Jeremy Shamos] of any kind of malfeasance. So how do they take the increasing pressure? Click through for my synopsis and review. As the group attempts to settle into their new “normal,” we just know that things can’t possibly be as smooth as they seem. There have been a few hints of underlying issues with the Alexandria community since the very beginning; in fact, Aaron and his presentation seem just about the smoothest part of the whole place (then again, that’s what you usually get from brochures advertising retirement communities). So, with the inevitable entropy that is the hallmark of The Walking Dead, tonight, three shows to the end of the season, seems like just about the right time to throw the monkey wrench (spanner for my British readers) into the works. And while we do, indeed, get some of this, it all happens in what is, for my money, the best paced and edited episode of the season so far. In a more-potty-mouthed-than-usual episode, Steve and Dan complain about rough-around-the-edges Rick and homosexual stereotypes. Contains mild comic-book spoilers and juvenile tittering. Does becoming the voice of reason mean a death sentence for Michonne? Why is Glenn channeling Dirty Harry-era Clint Eastwood? Will the group pass Aaron’s audition? And can you trust a man who doesn’t like apple sauce? 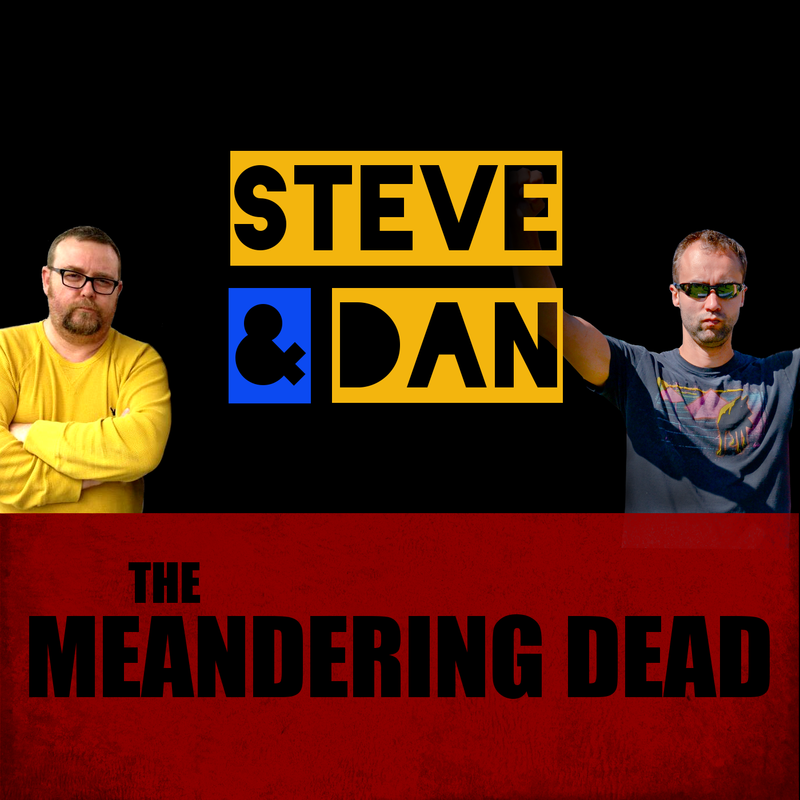 Steve and Dan discuss Harrison Ford, whale meat, and arseholes — all in glorious terrible audio quality and three weeks late — yup, it’s the Steve and Dan Walking Dead Podcast. Right up front, I need to make a brief mea culpa for this review: I’m enjoying Better Call Saul so much, that I’m afraid it’s beginning to impact my reviews. Tonight gave us insights into Jimmy’s character that somehow seem to make up for the foibles on display last week, as well as developing both Chuck and Mike Ehrmantraut. Granted, the Ehrmantraut piece comes at the very end of the episode, and is an obvious set-up for next week, but the focus on Chuck brings to mind the kind of early plot development and foreshadowing Gilligan and Gould showed us in Breaking Bad, specifically beginning with Season 2 (pink teddy bears, anyone?). With strong reservations, Rick and the crew decided to follow Aaron to Alexandria last week, with some – such as Maggie and Michonne – being in favor of following Aaron, and others – Rick, Carol, Daryl – being less enthusiastic. But although they do have their differences within the group, there’s one thing for certain: when Rick refers to the group as his family, he means it with all his heart, and there better not be anyone looking to mess with them. So now that they’ve arrived at the gates of the Alexandria Safe Zone (as it is called in the comics), is this going to be Rick’s Ithaca? Or is his voyage not truly complete yet?